Why is it that people are naturally attracted to the flames from a fire place or firepit? Fire has since the dawn of the ages played a significant role in the evolution of the species and has always had a mesmerizing effect on people gathering around it’s radiance, warmth and mood altering hypnotic powers. 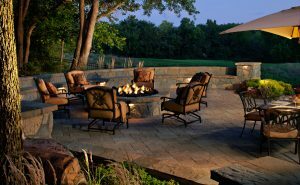 Our design and implementation professionals have a ton of experience designing and building fire places and fire pits as part of your outdoor expansion project. There a number of design criteria, material stone choices and natural wood/coal or gas fired with remote start options. We are IVY Studio, a landscape design consulting firm based in the greater Boston area specializing in residential outdoor expansion projects and would love to fire up your enthusiasm and warm your appetite for an outdoor fire feature as part of your expanded outdoor project. Contact us at 781-591-0300 or vern@ivystudioMA.com for a spark of inspiration.